Tubular deep cycle lead acid batteries are recommended for energy storage in off grid solar photovoltaic applications. The tubular batteries have higher life expectancy, longer cycle life, minimal water loss, and charge faster than conventional flat plate lead acid batteries. 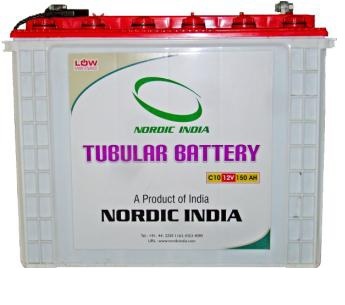 Solar batteries are offered by Nordic in 12V and capacities of 100AH, 150AH, and 200AH. The batteries have been tested at CPRI and certified to meet IS13369:-1992 standards.